Summer is coming to an end but before that happens we've got some really exciting events coming up including the Allagash Lobster Bash and the very first release of beer from Urban Roots Brewing! As some of you may know, our owner Rob Archie has partnered with brewmaster Peter Hoey to open up Urban Roots Brewing & Smokehouse in downtown Sacramento. Over the past few weeks, Peter has been brewing collaboration beers with Three Weavers, Alvarado Street and Cellarmaker. They'll be debuting these beers at Empress Tavern on September 7th, during an event for the California Craft Beer Summit and we hope you'll join us! More information and the link to purchase tickets is below. Join us for the release of 3 collaboration beers masterminded by Urban Roots head brewer Peter Hoey. Peter has gone up and down the state to produce collaboration brews with Alvarado St, 3 Weavers, and Cellarmaker. 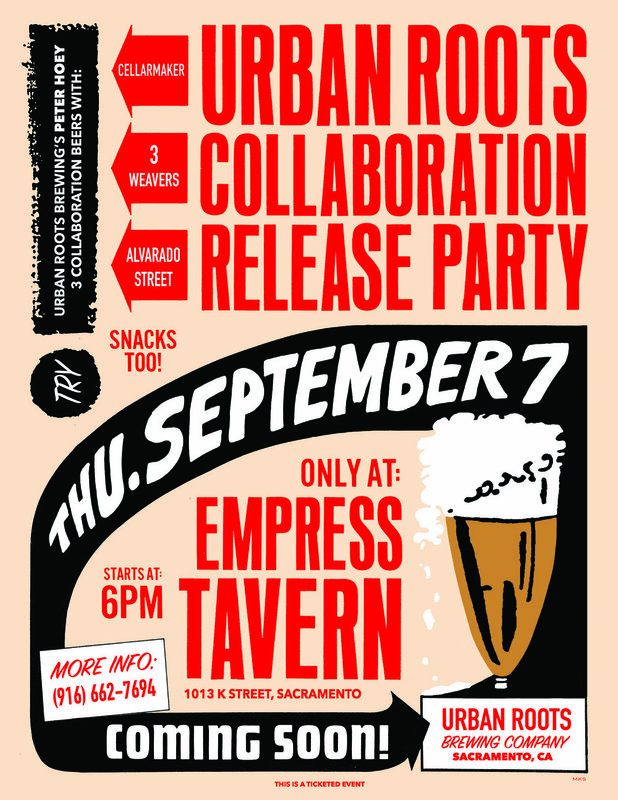 We're shuttin' down Empress for this event to release these beers! Attendees will receive 1 10-ounce pour of each of the 3 collaboration beers. Attendees will also receive a choice of either an Empress Burger, Fried Chicken or a Fried Green Tomato Sandwich (vegetarian). Additional drinks will be available for purchase at the Empress Bar. No other food (other than what is listed above +fries) will be available. This event is not a seated dinner (though there will be some first-come-first-served seating available). Food and beer will be stationed in different parts of the restaurant for guests to access. Guests are encouraged to roam around. Ticket includes a 15% service fee and taxes.. This is a 21 and over event. Menu is subject to change. Space is limited. Join us on Thursday August 31st for the Sacramento can release of Disco Ninja, a Hazy NE IPA collaboration by Revision Brewing and Shoe Tree Brewing. This is the first Hazy IPA from Revision and only their second can release. Cans will go on sale at 5PM sharp. We will also have Disco Ninja, Leafy Greens, and Citra Revenge on tap until the kegs kick!